Malina Hubcheva was born in Varna. She graduated the “Dobri Hristov” Secondary Musical School in her hometown, and in 1990 she graduated the Higher Music Pedagogy Institute to the State Music Academy – Plovdiv. Between 1992 and 1995 she worked as a sound and music director in the “Varna”, “Galatea” and “Atlantic” radio stations. From 1992 until present day, she has been working as a prompter in the Opera and Philharmonic Society – Varna. 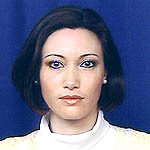 From 1995 to 1998 she was chief specialist in “Education and culture” Department in Varna District Administration. In 1998 she graduated choir conducting with Prof. Kroum Maksimov at the “Pancho Vladigerov” State Music Academy – Sofia. Since 1998 she has been choir master of the choir to the Opera and Philharmonic Society – Varna. Her repertoire includes all the titles in the current repertoire. She has participated in the tours of the Opera in Germany, Switzerland, Austria, Italy, Spain, France, Cyprus, etc.